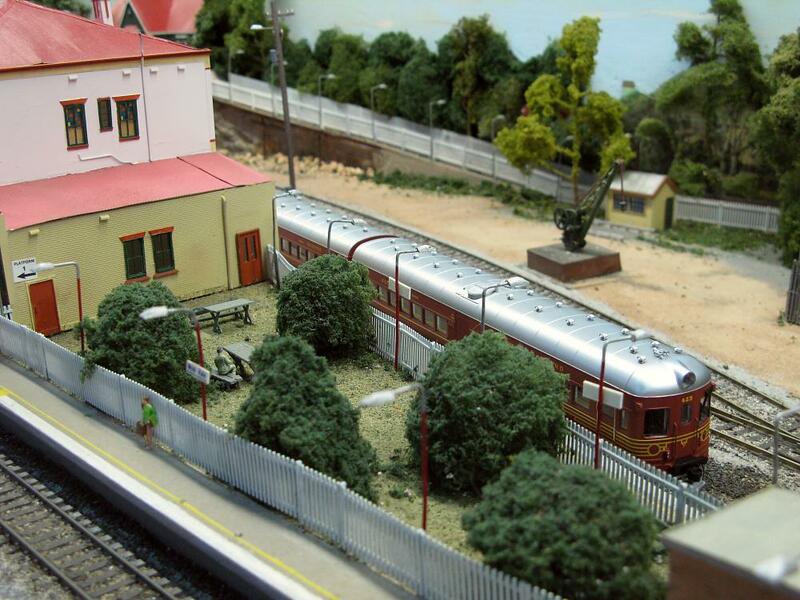 "Moss Vale" was an HO scale exhibition layout constructed and operated by the Guildford Model Railway Group. Construction commenced in 2000 after much research and numerous site visits. The layout measures 6.0 metres (20') long by 2.8 metres (9') deep. "Moss Vale" the layout is based on the town of Moss Vale, located in the beautiful Southern Highlands of NSW, 145 kilometres from Sydney on the Main Southern railway line. It is an important station on the Main South Line and is also the junction for the branch line to Unanderra. The layout models many of the features of the area - including the significant station buildings, the double track through truss bridge over the main road, and the junction with the line to Unanderra. The layout itself is modelled to represent the year 2000, with the trains being typical of those that ran through Moss Vale from the steam era through to those that can be seen at Moss Vale today. Locomotives and rolling stock are individually owned by the group members, being scratchbuilt, kit-built or kit-bashed. The layout consists of 6 separate modules - 2 each at the front and back and 1 at each end. The framework is plywood resting on aluminium 'A' frame legs. The layout is operated by conventional DC block control, with a separate controller for each of the Up and Down main line tracks and a third controller for the Unanderra line and sidings. This allows for continuous operation of the double-track main line. A 14 track storage yard at the rear provides ample storage for the many different trains. Moss Vale was exhibited from 2002 to 2008, and has retired permanently from public viewing.